3/12/19-TUESDAY’S TIP: It’s National Pancake Day today! Use Monday’s leftover red beans for Red Beans & Rice Cornbread Pancakes easily made with cornbread mix, for you always need cornbread with your beans, right?! Get the recipe here Happy Pancake Eating! 3/5/19-TUESDAY’S TIP: Happy Mardi Gras! 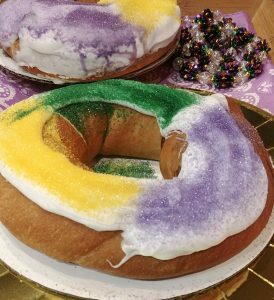 Have tons of King Cake to eat? Stale King Cake? Try ten new ways of enjoying the sweet treat from King Cake French Toast to Fried King Cake! 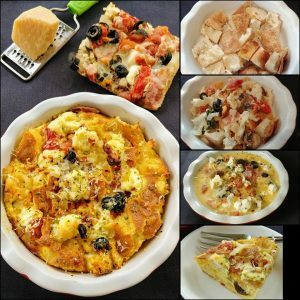 Get recipes here. 2/16/19-TUESDAY’S TIP: Have leftover grits & grillades? Add a little cream cheese to the grits & use as a filling for an omelette. Top omelette with heated grillades. No grits and grillades? Use roast, rice, & gravy the same way for a delicious start of the day! 2/12/19-Looking for some sweet treats for your Valentine? Look no further than your fridge, pantry, or freezer. Had a fun morning sharing quick & easy ideas to show some love like cookies and cream French toast. Thaw a bit. Pull off all crust from cold leftover pizza leaving toppings. Break crust into pieces to line a buttered dish. Chop up the toppings and add to dish along with any other desired toppings. (I added goat cheese.) Repeat layers. Beat eggs, milk, and red pepper together. Pour over casserole. Let sit 5 minutes. Bake 350* 20-25 minutes or until eggs are set. Sprinkle with cheese. Can be made in smaller dish with just one leftover slice, too. Perfect for brunch! 2/5/19-TUESDAY’S TIP: It’s Mardi Gras season and that means King Cakes. This is my favorite weekend breakfast treat: King Cake French Toast!! Cut King Cake into slices & use your favorite French Toast recipe but get ready for a sweet sugary glaze surprise. 1/29/19-Don’t waste money on Super Bowl party decorations. Decorate with newspapers, magazines, or paper. Have kids glue football figures to cardstock and make cut outs (or do it yourself & feel like a kid again!). Get creative with the cutouts–hang them off chip bowls, line them up with refreshments! No time for cutouts? Use football pictures under clear wrap for food trays or draw some easy football plays on paper to line serving trays. 1/22/19-Like paella? 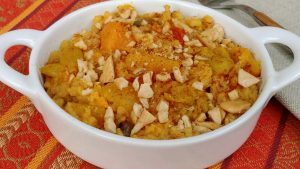 Turn leftover plain rice into a Curried Rice Treat! Melt 1 TBSP butter in a saucepan over low heat. Add 1/2 tsp curry powder and stir constantly for 1 minute. Stir in 1/2 cup cold leftover rice and continue to cook for 2 minutes. Then add in any of you favorites like raisins, grapes, onions, peppers, and nuts or my favorite, leftover fruit salad with cashews. Continue to cook until heated through. Want a bigger meal? Double amounts and add in cooked leftover shrimp, pork, or chicken. 1/15/19-Have a banana for breakfast? Save the peel and use it to make one of my favorite dinners! Toss the peels in a covered container with a squeeze of lemon. Season thin boneless skinless chicken breasts, I love curry powder. Wrap chicken with peels. I add a little coconut water over them. Bake at 400* for 10-12 minutes or until fully cooked. The peel will help keep the chicken moist. Serve over jasmine or coconut rice. Yes, you CAN eat the cooked peel, but I find it very fibrous, tho! Not in the mood for chicken? Toss a banana peel in the pot when cooking a roast. It will help keep it moist, too! 1/8/19-The Holiday celebrations are over & it’s the New Year. Did you drink all the champagne in your fridge? If not, and it’s flat, don’t pour it out. Pour it over a salad instead! CHAMPAGNE VINAIGRETTE: Whisk together 1/2 cup oil, 1/4 cup champagne, 1 tsp chopped fresh dill, tarragon, or thyme (or substitute 1/2 tsp dried), salt, and pepper. Only have a couple sips leftover? Reduce recipe by half and you’ll still have plenty for 2 salads!